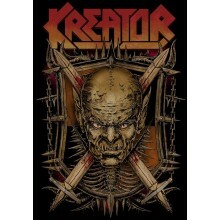 If you’re a fan of thrash metal, chances are you are aware of German thrashers Kreator. Formed in 1982, these thrashers are generally known as a member of the German Big 3 of thrash, along with Sodom and Destruction. If you fit in to the category of thrasher, chances are you will be delighted to know that Kreator will be embarking on a North American Tour that includes both the States and Canada. No word on any opening acts yet. Kreator posted the following on their Facebook page: “US/CANADA TOUR ANNOUNCEMENT COMING ON THURSDAY! Stay tuned!” along with the picture displayed as the article’s featured image. Keep it right here on cosmosgaming.com to see if and when Kreator will be coming to a town near you! See you Thursday!